NASHVILLE, Tenn. (April 29, 2016) – Just in time for Mother's Day, Warner Bros. Home Entertainment will release the critically acclaimed film Dolly Parton's Coat of Many Colorson DVD for the first time on May 3, 2016. Experience the magic and warmth of the television movie event that is based on the inspiring true story of living legend Dolly Parton's remarkable upbringing in rural Tennessee. In support of the DVD release, Dolly will head out on the promotional trail and appear on Access Hollywood on April 30th, CMT After Midnite on April 30th and CMT’s Hot Twenty Countdown on April 30th and May 1st, CBS This Morning and Yahoo TV on May 2nd, CMT Radio Live on May 2nd, Entertainment Tonight Canada on May 3rd, GAC’s Great American Playlist on May 3rd and May 12th, CBS This Morning on May 5th, CBN’s 700 Club on May 6th, PBS’s Metro Focus on May 5th and May 8th with additional features with Parade, People Magazine, Huffington Post, Fox411, Rolling Stone Country and more. To date, the initial broadcast ofDolly Parton's Coat of Many Colors has delivered 15.9M total viewers (Live+7), becoming the #1 movie on broadcast with total viewers in more than 6 years. * Furthermore, Dolly Parton’s Coat of Many Colors has the highest total viewer L+SD to L+3 increase (2.548 M) ever! ** The family-oriented faith-based movie stars Jennifer Nettles (award-winning singer/songwriter and lead vocalist of the duoSugarland), Ricky Schroder (NYPD Blue, The Lost Battalion, 24), Gerald McRaney (Agent X, Mike & Molly, Longmire, House of Cards), and Alyvia Alyn Lind (Transparent, Revenge,Blended). 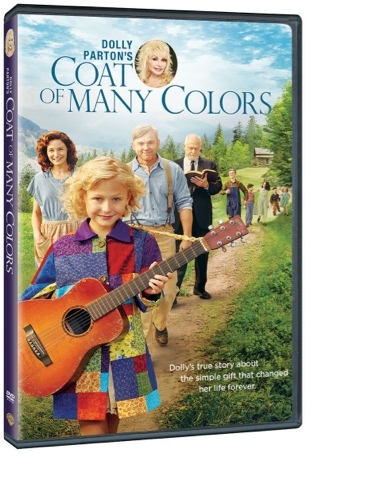 Dolly Parton introduces the film and serves as narrator.Dolly Parton's Coat of Many Colors also contains an alternate version of the movie, deleted scenes and heartwarming extras. The DVD is priced to own at $19.98 SRP. This once-in-a-lifetime special takes place inside the tight-knit Parton family as they struggle to overcome a devastating tragedy and discover the healing power of love, faith and a raggedy patchwork coat — vividly described in the well-known song of the film's title — that helped make Parton who she is today. Set in the Tennessee Great Smoky Mountains in 1955, this poignant and uplifting family-friendly story follows the incidents in Dolly and her family's life around the time she was nine years old.